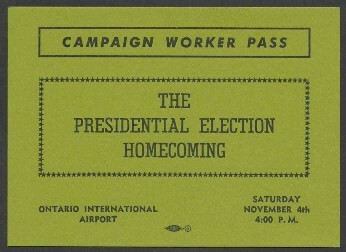 This is a nice combination political and historical memorabilia, the campaign rally broadside from Richard M. Nixon's last election campaign event and a campaign worker pass to that same event. 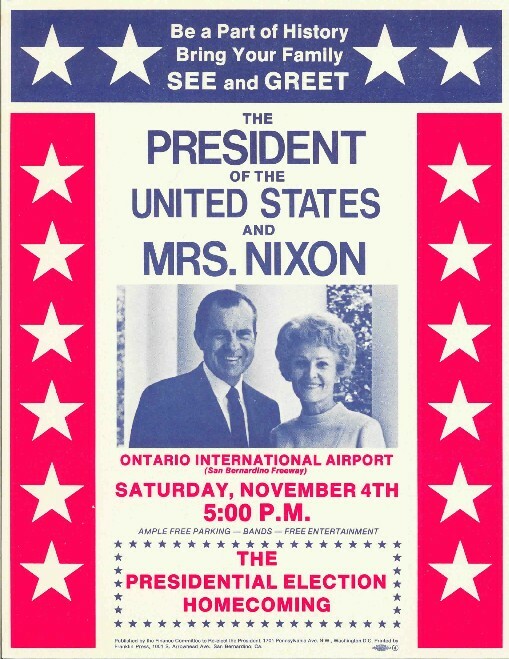 The event on November 4, 1972 was at Ontario International Airport which was near the Nixon home in California where he and his wife Pat were going to be for the election returns. The election was not expected to be close, and it was not, with Nixon winning every state except Massachusetts and the District of Columbia, so the traditional campaigning until the day before the election was not necessary. The broadside and ticket are in excellent condition with the broadside being letter size, 8 1/2 by 11 inches and the worker pass is 4 x 6 inches.